The Camp Wheeler Spokes, led by the hitting of Cecil Travis, defeated the Enidairs from Enid, Oklahoma, 8-3, last night in the national semi-pro baseball tournament. Travis hit a home run in the seventh with two men on. Cecil H Travis was born on a farm in Riverdale, Georgia on August 8, 1913. His professional baseball career began in 1931 at the age of just 17, when he hit .469 with Chattanooga of the Southern Association. He batted .356 with the same team the following year and was called up by the Washington Senators in May 1933, getting five hits in his first game. 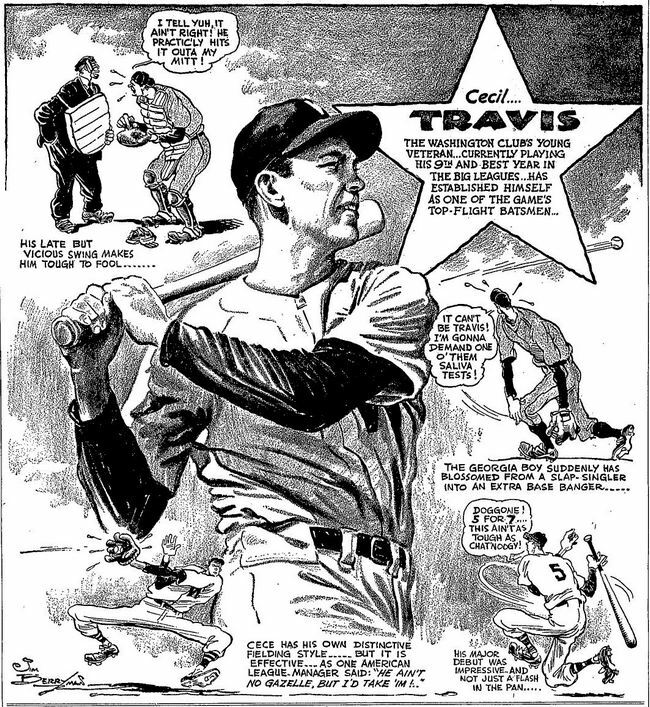 Despite his age Travis quickly established himself as one of the outstanding players of the American League. Had he not been playing for the perennial second-division Senators he would have been hailed a superstar. Playing shortstop and third base Travis had compiled a lifetime batting average of .322 by 1940, and his 1941 season – his ninth in the major leagues – was by far his best. Playing in all 152 games for the Senators, Travis batted an outstanding .359 (second only to Ted Williams’ incredible .406). He led the league with 218 hits and finished second with 19 triples. He also had a career-high 101 RBIs. But as quickly as Travis reached the top of his game his career was put on hold. He entered military service on January 9, 1942 and would be away from the game for four seasons. He thought he might be in for a year or so, “but you didn’t think you were going to be there so long,” he later said. Travis was assigned to Camp Wheeler, Georgia as a private in the special services branch. When he reported to camp his greeting from Colonel Charles P Sutherland was: "Well, son, you've finally caught up with a world championship outfit." 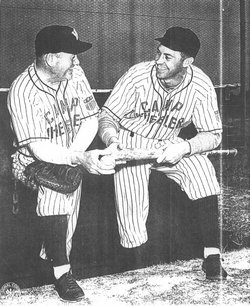 Travis played and managed the Camp Wheeler Spokes baseball team and led the team in hitting with a .472 average after ten games in 1942. The Spokes went on to win the Georgia State semi-pro tournament in 1943 and finished the year with seven straight wins to capture the National Semi-Pro Baseball Championships at Wichita, Kansas. 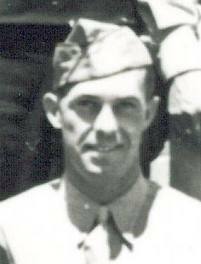 In May 1944, Sergeant Travis was assigned to the 76th Infantry Division’s combat training facility at Camp McCoy, Wisconsin, where he played baseball with the 76th Infantry Division team. Teammates includes major leaguers Bama Rowell and Bill Evans. The 76th Infantry Division captured the Wisconsin State semi-pro championship in 1944. The 76th Infantry Division was sent to Europe in late 1944 and entered combat on January 19, 1945, during the final stage of the Battle of the Bulge. Travis suffered a bad case of frostbite during that time, that necessitated an operation. "Heck, you was in that snow," he recalled some years later, "and you was out in that weather, and you was lucky you got to stay in an old barn at night. The thing about it, you'd sit there in those boots, and you might not get 'em off for days at a time. And cold! You'd just shake at night. Your feet would start swelling, and that's how you'd find out there was something really wrong - you'd pull your boots off, and your feet is swelling." The 76th Infantry Division advanced more than 400 miles against hostile resistance in 110 days of combat. It captured more than 33,000 prisoners and teamed up with the 6th Armored Division to form the spearhead of the Third Army’s plunge across Germany toward Czechoslovakia. The division was within 50 miles of the Czech border when the war in Europe ended. Travis received a Bronze Star and four battle stars during his time in Europe. He brieflt played baseball with the Division team but took an option to serve in the Pacific in return for leave to visit his wife and newborn baby in Georgia. While at home, Japan surrendered and Travis applied for his discharge. Working out with the Atlanta Crackers at Ponce de Leon Park while stationed at Camp McPherson, Georgia, Travis had accumulated 97 discharge points and was honorably discharged on September 6, 1945. He immediately returned to the Senators. "It was amazing the way Cece swung in his drill at Griffith Stadium yesterday,” reported John B Keller in the Washington Evening Star on September 8, 1945. “His easy left-hand stance at the plate was no different from that he assumed when he was one of the sensations of the American League in offense." But the truth was the 31-year-old was seriously out of condition. He was slow afoot, his bat speed was sluggish and his feet still hurt. 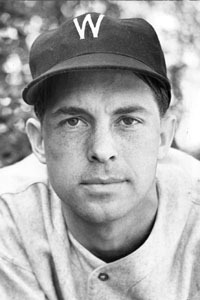 Travis played his first major league game in four years on September 8, 1945 against the Browns. He played 15 games before the season ended and batted just .241. Everyone, including Travis himself, hoped the off-season rest and spring training would bring back the magic. In 1946, Manager Ossie Bluege played him a lot of the time at third base where less range was required, and there were days when he looked like the pre-war all-star he had been. But they were few and far between. Travis batted just .252 in 1946 and struggled to keep his average above .200 in 1947. For the first time in his career, he found himself sitting on the bench. “Cecil Travis,” McGowan replied without hesitation. Travis left the game as graciously as he had come into it. "My problem was my timing. I could never seem to get it back the way it was after laying out so long. I saw I wasn't helping the ball club, so I just gave it up." Travis declined an offer to manage in the minors and returned instead to his family cattle farm in Georgia. “I would like to have done better when I came back,” he said, “but I feel lucky to have come back at all. Cecil Travis, of whom Ted Williams once said “is one of the five best left-handed hitters I ever saw,” passed away at his home in Riverdale, Georgia on December 16, 2006. He was 93. He had been inducted into the Georgia Sports Hall of Fame in 1975 and added to the Hall of Stars at Washington’s RFK Stadium in 1993. Despite his .314 career average being better than 19 of 21 Hall of Fame shortstops, Travis has been overlooked by Cooperstown. Thanks to the late Cecil Travis for help with his biography. Created January 14, 2007. Updated April 29, 2008.